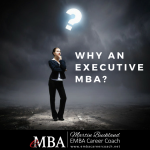 I Was Told My Executive MBA Was Just an MBA! 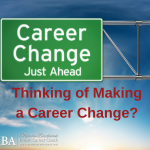 You’ve worked hard to juggle your job, family, and education for a year or more and earned a prestigious advanced degree with your executive MBA. 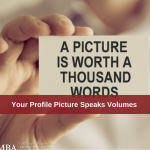 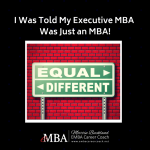 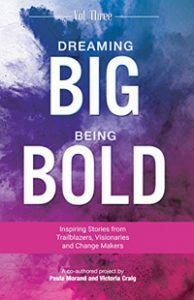 While frustrating to have a friend or family member underestimate your new degree, it can be career-limiting to have an employer or hiring influencer fail … [Read more...] about I Was Told My Executive MBA Was Just an MBA! 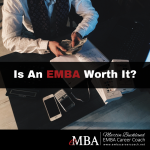 Are you wondering why an executive MBA would be worth the time, effort and expense? 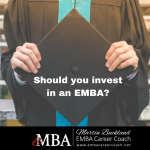 In my line of work, I enjoy the opportunity to speak to quite a few recent eMBA grads, and here are the reasons they’ve chosen to invest in themselves and their career by earning this impressive graduate degree: … [Read more...] about Why an Executive MBA?